I will confess that in my youth I brought more store bought plastic spoons and forks than I ever brought covered dishes and crock pots of fresh made love and caring delights. But now that I have become a hobbyist cook, I occasionally am reminded of those days and people from my youth. I reminded and I do wish that I could drop a dish of some new creation on those old tables at my fondly remembered Liberty Baptist Church. Tables lined with newspapers and loaded with God's bounty prepared with love and caring. This loaf is loaded with the flavors of that Red Rooster labeled sauce, SRIRACHA!But with all the other flavors mixed in this simple meatloaf is transformed into something amazing! Here is the recipe and techniques needed to replicate those Custard Stand Chili Dogs of your youth. Specialty Meat (no Beans, Simmered in beer), Simple but delicious Slaw make a seemingly simple hot dog into a delight. YOU CAN DO THIS... YOU CAN MAKE DINER Quality CHILI DOGS AT HOME! This one is (for the price) just about as good as it gets. Love the dramatic presentation. But also LOVE LOVE LOVE the cost. This tray comes in at about $12 for the tray. Fruit ain't cheap. Here's my favorite! Unlike Mac and Cheese which needs a bit of constant work to keep the cheese from congealing, this Macaroni Salad is perfect when you need to plate ahead of time and serve either chilled or room temperature. There is a little garlic in there, plus all the fresh flavors in a honey mustard salad. These have that wonderful combination of Heat (I used a sprinkle of Cajun Spice mix) with the sweat of Candy Bacon. All that heat/sweet flavor wrapped inside a savory piece of grated potato and BACON! Not just any Deviled Eggs, these have a tremendous presentation... a wonderful almost neon look outer coating of the eggs. The accent color is very easy to add. And flavors of Pickled SWEET Pickled Jalapenos and Beets! 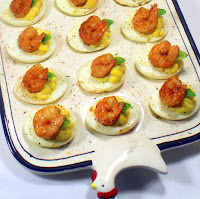 New Orleans Cajun spiced shrimp top a smooth creamy cheesey mustard based deviled egg. Stunning presentation to go with the over the top flavor mix. These are the deviled eggs of your youth. The ones your Granny made. Sweet and creamy "goo", with hints of the tangy pickle brine from Dill Pickles. I dressed 'em up a bit with a piece of that dill pickle for a bit of crunch in the texture. Reuben Sandwich Style DEVILED EGGS! These have all the flavors and ingredients of the classic Reuben Sandwich. That is, Corned Beef, Sauerkraut, Swiss Cheese and a drizzle of Russian Dressing. LOVED THESE! California Roll Sushi Deviled Eggs! These have all of the flavor and ingredients found inside the most popular Sushi roll... The Famous California Roll. A bit of fish (in this case I used lump Crab meat, but some smoked salmon would work as well), Cucumber, Avocado, Wasabi Paste... All gloriously displayed in the form of a Deviled Egg! What a pain in the rump to peel the eggs. Half the time the eggs just get ruined and you would be ashamed to serve to your friends and neighbors... BUT there is an easy way to get perfect eggs all the time... REALLY YOU CAN DO THIS!!! Loaded with Tex Mex flavor with the meat of avocados mixed into normal deviled egg filling. Add a fresh made Pico De Gallo lots of lime and even a SURPRISE TROPICAL INGREDIENT! These have that unique flavor of a classic Bloody Mary Drink... Tomato juice is replaced with thick tomato paste. Since the paste is thick you can thin the mix a bit with actual VODKA! Add traditional flavors like Worcestershire Sauce and Spices These are WOW what FUN Dish! Sweet Savory Pumpkin Pie Mix (Yes from a can) combines with Herbal Rosemary and Earthy Sea Salt into the world's BEST Dinner rolls. AMAZINGLY EASY, This is the BEST PRESENTATION, TASTING ROLLS EVER AND Bread Machine Easy to boot! These are amazing. Stunning presentation, beautiful colors and an extra strong punch of Sea Salt and Earthy Herbal Rosemary. And the applesauce adds plenty of extra flavor and moisture, guaranteeing a moist and tender roll. And best of all, Bread Machine easy. Lemon Poppy Seed Mini Muffins! They have a wonderful presentation look. Not only the speckles of poppy Seed but also the mild lemon yellow color. Lemon sugar is the key to these muffins, turning a simple muffin into a star of Pow Zap Zing extra flavor. These are beautiful LOADED muffins with tiny Chocolate Chips (to match the size of the tiny muffins) spread through out the sweet creamy muffin... Like the best parts of a soft chewy chocolate chip cookie! A Lot Cheesy, a little bit Spicy, A surprising hit of extra Garlic and Earthy Sesame. Salt adds the seasoning and indeed you have a truly LOADED Mini Muffin! These are uniquely almost healthy. LOADED with fresh grated zucchini. Of course zucchini is one of those veggies that always seem to be fresh and available year round. Raspberry Peach Mini Muffins with Peach Schnapps! These have an incredible presentation of a bursting raspberry in the center of a peach loaded muffin. With just a faint hint of peach booze to make this an amazing adult muffin destined to be legend around your Cul-de-Sac! Moist and tender. accented with flavors of sweet fresh tomatoes and Earthy green onions. Then top everything with the creamy goodness of Goat Cheese and you have a memorable flavor combination. These muffins are perfect for a special occasion (Christmas and Cranberries just seem to go together). They sit around the counter to munch on throughout the day and they add a whimsy factor to your conversation! A GREAT POTLUCK DISH! ...The best thing about this fudge is that the color and the flavor is so incredibly easy to make. Jell-o Yeap, flavored Jell-o, added to the very very simple base and you have any color, any flavor ... Any salute to any sport team you like. Only 4 total ingredients, take less than 5 minutes to make. You need to watch those sales to make this a good value, but this is a delicious change of pace from the traditional. Loaded with nutty tasting Parmesan Cheese, Cheesy snack crackers and best of all, the savory creamy goodness of Ranch Dressing! 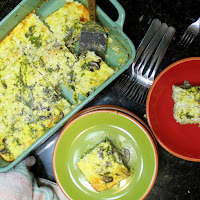 Salty, Savory, Cheesy and DELICIOUS... oh and EASY FAST and did I say EASY! And just about the easiest appetizer to make and certainly the BEST TASTING, EASIEST and CLASSIC Appetizer around. The combination is classic Italian, been around for centuries. I dressed the presentation up with some shredded coconut and ribbons of mint. These are watermelon slices, air dried to form firm slice of watermelon the size of a cookie. The "icing" on the cookie is a sweet Italian cream cheese. The mascarpone is made even sweeter and creamier. The piping is a simple star tip and you are done. Only a few minutes of hands on work..EASY, delightful, unusual, beautiful and exotically tasty! 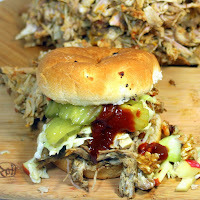 A perfect Bring and share BBQ PotLuck Dish! Little beautiful gems. Sweet Cherry Poppers, sliced and stuffed with Creamy Herbal Goat Cheese. Made pretty for any bring and share occasion. Simple, only a few ingredients and ALWAYS A CROWD PLEASING PLATE! Food on a stick! A Little stick, just a single bite, sweet gherkin pickles, wrapped in Black Forest Ham and a bit of cheese. Sounds like a sandwich with out the bread. Sounds like something those always present Low Carb Dieters would take a gobble of! Boy these are good... And FAST and EASY and has a unique flavor combination that makes your balls stand out among a big assortment of finger foods. Great appetizer and better Main Dish (just add noodles or rice). Easy and DELICIOUS! More Food on a Stick... A little stick. People LOVE bite size. People also like contrasting tastes and looks. The bright red deliciousness of savory herbed Cherry Tomatoes, paired with the sweet flavor of Pineapple, made pretty with a sprinkling of sweet Paprika and you have a perfect party appetizer. These are fantastic for a number of reasons... Beautifully colorful, a real standout of a dish. Easy, Really Really DIY Easy to make and cost effective, The whole tray of about 36 appetizers will come in at about a quarter each! Perfect dish for a catering appetizer or side dish, Great for a pass a plate PotLuck event or any big family gathering. CHEAP CHEAP CHEAP and classy appetizers (priced at less than 35 cents each). Cucumber coins topped with a seasoned cream cheese and then some DIY (yes, yourself, not store bought) Sugar Cured SALMON and you have something unique for any party table! VERY VERY EASY... Burrito size Tortilla, a Fresh Made Herbed Cream Cheese (with a secret ingredient that makes it smooth and spreadable), A PUNCH of flavor from a Fresh made (or use a jar) Sun Dried Tomato Pesto plus the colorful greens of Spinach combine for a quick easy Appetizer (and inexpensive if you are making dozens)! This is a GUARANTEED EMPTY PLATE! All the flavors of a classic Reuben sandwich (Swiss Cheese, Russian Dressing, Irish Corned Beef and German Sauerkraut in a hand held "Just a Little Bite Appetizer. PEOPLE LOVE THESE! Aaah the joy of the Pinwheel "Sandwich"! Easy and FAST to make with my 5 Minute Hummus Recipe. This time flavored with a BBQ Spice Mix and wrapped around Sweet Apples, Sweet Grapes and even Sweet Red Onions... A Heat and Sweet and healthy vegetarian alternative for Snacking or a welcome addition to any group Pass-a-Plate occasion! Here's a fantastic little summer appetizer. And EASY! only 3 ingredients (plus the tortillas). Picante is an Hispanic word meaning spicy. Just a bit deceiving and you control the amount of spice and heat in the wheel. The "Secret" Ingredient in the wheels is a cup of Salsa. If you reach for the mild Salsa, make these mild. If you crave the extra heat of a Hot Salsa... go for it!. Easy, Simple ingredients, Memorably Tasty ... Fantastic indeed!! YUM! Here's one of those ugly dishes that is absolutely AMAZING! And incredibly easy to boot! There are plenty of hints and tips for the technique of making fresh made guacamole. 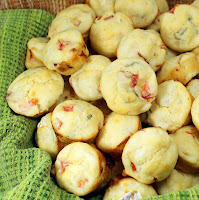 Always a crowd pleaser and welcome "bring along" dish for any PotLuck or big gathering. This is an incredible recipe, combination of traditional with technique to bring out the most flavor... and a SECRET Ingredient... Shhhhh. Easy to make and a delicious Southern classic... This is a simple measure and mix "dip" or sandwich spread. Perfect as a dip, spread, hostess gift, or welcome addition to a Holiday buffet. The taste is addictive and sure to be a favorite among family and friends... and did I say EASY. The payoff for the amount of work is worth all the effort to make fresh! WOW... This is my GOTO Recipe when I need to bring something (or serve) to IMPRESS! A RICH lemony dip LOADED with flavor, filled with crab meat and creamy and cheesy enough to delight a crowd. INCLUDES a recipe for fresh made tortilla chips to really impress that sister-in-law!!! What sounds more Old School than Deviled Eggs? This recipe has all the basics as well as hints and DIY tips for hard cooking eggs, seasoning and making them pretty to transport and stand out on a table with lots of choices. Bet you can;t eat just one! I am not even sure if it is possible to have a Church Potluck and not have a plate or two of Deviled Eggs. Relatively inexpensive, Ingredients are probably already in your pantry and once you get the knack, EASY to make. But rarely are any two plates identical. This recipe will stand out as the creamiest since one of the ingredients is a brick of Cream Cheese. Adding a creamy texture and a mild sweet cheese flavor. It's just hard to imagine any big gathering, PotLuck or pace a plate meal without these "Old School" recipe Just Like MOM used to make (or maybe Grandma). Rich and creamy egg yolks fill the center and yes, there is an old school secret that makes these extra sweet. These are the eggs June Cleaver took for a Church Potlucks and still the best! I even cracked the secret to getting eggs peeled easy and perfect... read on! ... It's Deviled Egg time again! Just about any time my Church has a PotLuck meal I always like to make a plate of deviled eggs. The list of possible ingredients is just about endless but I always like to add a little of my own specialty ingredients... Or a fan favorite like BACON BACON BACON and even a second favorite... Ranch Dressing. There's even a recipe for Seasonal CRANBERRY BBQ Sauce... Now that's a PARTY!! OH BOY DEVILED EGGS.. And these are certainly dressed to impress for any gathering, potluck or just to serve something AMAZING! New Orleans Cajun spiced shrimp top a smooth creamy cheesey mustard based deviled egg. Stunning presentation to go with the over the top flavor mix. Just 3 ingredients, simple to DIY and you have a toy (the kids "flew" with these before they chomped down). Takes only a few minutes to make a BUNCH... and EASY! ONLY 3 INGREDIENTS and wildly popular . Crispy and crunchy with hints of nutty cheese... Like a bacon and cheese sandwich all made into a finger food. FIRST PLATE EMPTIED AT A RECENT "Pass a Plate" Appetizer Party! Very easy and tasty treats that will delight. 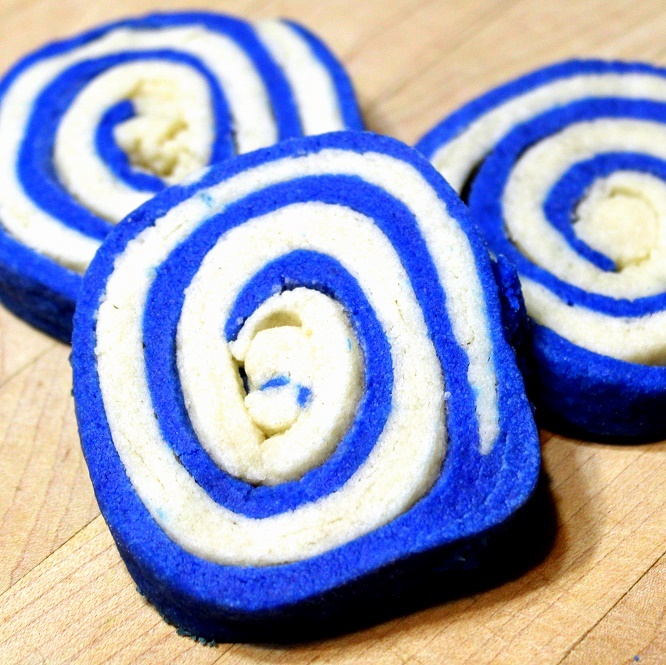 The blue is colored white chocolate , easily decorated to look like a cartoon of an ocean scene. Whimsical, Fun and tasty... A great combo for a group of younguns! Quinoa - Craisins - Almonds - Grains - Spinach !!! And all flavored with a fresh made HONEY LEMON VINAIGRETTE. Oh MY, so good you will not know how good for you this is! All of the popular SUPERFOODS are combined into something colorful, flavorful, and so filled with mixes of flavors; your family and friends will insist this becomes a regular dish! EASY and a STAND OUT DISH! Beautiful Colors... Amazing mix of tastes and textures. A wonderful crowd pleasing salad loaded with summer tastes that you can have year round. The easy to make shaker jar Honey Peach Vinaigrette, flavors both the pasta and the spinach adding a ONE-TWO PUNCH of Peach flavor to the entire dish! DIYing this is as simple as opening a bag, a can and a box. Only cooking involved is the pasta. The Vinaigrette takes seconds to measure and just a minute or two of shaking. Beer Bread may sound odd for a Church PotLuck, but the bread is dense, the alcohol cooks out (NO ALCOHOL), leaving a bread flavored with Hops and Malts and stays texturally ideal for this salad of fresh tomatoes, onions, peppers all marinated in a Honey Mustard Vinaigrette! God's Bounty of colorful seasonal and deliciousness! This is an OMG Salad. Lots of little extras... Goat Cheese crumbles add a surprising taste, Sweet/Heat Candied Spicy Pecans, Tart Snappy crispy Apple slices, Pickled red onions (pretty and tasty) and a sweet Maple vinaigrette all blend together for a salad worthy of company, Holiday meal or when you want to show off at a PotLuck! Love this salad, wonderful Holiday Colors, Mix of textures and seasonings. The fresh made HONEY MUSTARD COATING adds a fantastic PUNCH of flavor. 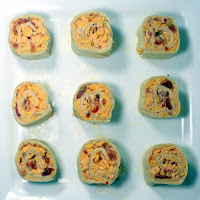 Perfect for potluck or any family get together! THIS IS SOOOO EASY! And the spectacular presentation is the hook for a delicious tasting treat. The new NEON colors and Bold flavors of Jell-o will make this EASY Dish stand out among a table full. 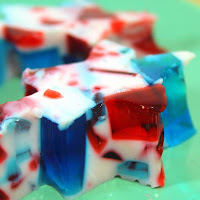 The individual cubes are suspended in creamy sweetened milk gelatin... Sweet, Boldly flavored and DELICIOUS... Oh and EASY EASY EASY! What's more old school than Egg Salad? This here is a basic recipe your Grandma would be proud of, with just a few interesting extras and a couple of tips. From "How to Boil Eggs" to an unusual ingredient (Sour Cream), this is the BEST Egg Salad I have ever had. 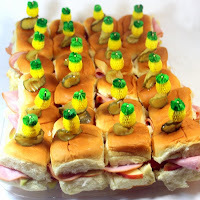 Here's another June Cleaver style 50's Church Basement Nostalgia recipe. Goosed up a bit with a few extra ingredients, but a version of this has been around for decades. Wonderful served cold, easy to transport. Deliciously easy to make (only cooking is the eggs and bacon, other than that it is an open, measure and mix recipe). Tastes Great, Easy to Make and may be one of those perfect PotLuck dishes for any pass a plate occasion! DEVILED EGG PASTA SALAD - Church PotLuck Side Dish... This is a FANTASTIC side dish. 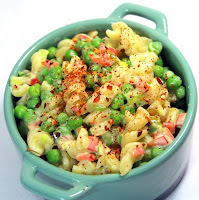 Surprisingly tasty, creamy sweet and tangy pasta salad. Best served cold, travels well so PERFECT to bring for any POTLUCK DINNER! All the taste of Deviled Eggs added to the sauce! I am always looking for an easy to make, quick to make but still distinctively flavored pasta dish. THIS IS IT! Olives and Blue Cheese and a honey mustard fresh made vinaigrette will make this dish stand out on any table! 52 Church PotLuck Holiday Leftover Ideas... There is "leftover" in the name but this is so good I;ll be making this any time i see a big slice of Ham on sale. There is a tart mustard and Worcestershire sauce covering everything, even some crispy caramelized onions over the top. A wonderful meal, low on meat but high on flavor. Just wish I had more leftovers to make another pan! This is a "Duh, Really is that all there is" recipe. Meaning it gets NO EASIER than this, but the pay off is a wonderful complex tasting side dish. Savory, Sweet, Herbal and versatil. Serve as a dessert or as a side dish (Delicious when topped on fish)! This is a classic recipe from the 70's but still just as tasty and just as beloved as any side dish could be. Seasoned with crumbled Doritos Brand Taco chips... Plenty of spice, Flavored with Ranch Dressing... Plenty of flavor... All wrapped around delicious Sweet Corn. Making this a crowd favorite for any gathering! I love the "Old School", Grandma recipes. And why not? They have met the test of time with hundreds of thousands versions of this recipe served at hundreds of thousands of church basements! There is a creamy gravy on the insides (if served right, the gravy is still bubbling right out of the oven). with a topping of crusty slightly crunchy top. A perfect mix of textures for your pallet. Deceptively easy considering the BIG payoff in taste and popularity. It is a winner in every sense. Always popular whenever I serve it. has all the classic ingredients, yellow mustard, hard cooked eggs and onions. But it gets all dressed up with the Salad Sprinkle, the Sharp Cheddar, Red Skinned potatoes (leave the skin on, better for you but also adds to the beauty). It also gets a zippy addition with a dollop of BBQ sauce. THE BETTER Mousetrap... Um POTATO SALAD! A wonderful exotic unique potato salad. Herbal deliciousness with plenty of DILL, cool summer cucumbers and a thick creamy coating make for a wonderful side dish! Includes hints for serving half and freezing half for another day... This is THE BEST Macaroni and Cheese you can imaging. 4 Cheeses make for creamy decadent deliciousness while the addition of the tomatoes add something uniquely special.. LOVE THIS!!! Church Potluck Side Dish, This is an Old School nearly forgotten seasonal recipe made back when Farm to Table was a way of life. This needs to be made with SWEET ONIONS. Back in the day, Vidalias were a rare treat. Only available a week or two or maybe a single shipment outside of Georgia. Those sweet onions STAR IN THIS FANTASTIC SIDE DISH. This time, everything tastes great UNDER a RITZ CRACKER! 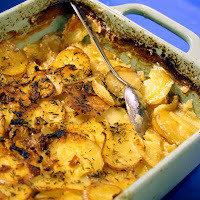 Cheesy Fennel POTATO GRATIN - Church PotLuck Side Dish...Oh Boy is this BEAUTIFUL... Golden Brown and Delicious. BUT it is also hints of sweet from the Fennel, Savory, Cheesy, a little nutty and a wonderful change of pace Potato dish. Tired of whipped potatoes, these will SHINE as a potato dish for any big Holiday meal, family gathering or Church or Neighborhood PotLuck BYODish event. Hints to get you through making a roux makes this easy and spectacular! Two traditional Holiday side dishes get a dressing UP for a fantastic sauce that adds a Nutty texture and taste to the sweet cranberry sauce. Use this sauce over some simple but wonderful flavored mashed sweet potatoes and you have a COLORFUL DELICIOUS NEW HOLIDAY TRADITION IN THE MAKING! Delicious change of pace for ordinary sweet potatoes. Savory enough for a side dish (this was my contribution to the family Thanksgiving meal) yet sweet enough for a dessert! Soft and creamy like a custard but the edges bake into a cake texture. All topped off with sweetened male flavored pecans... NOT TO BE MISSED! 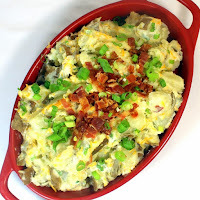 This recipe has it all, sweet, creamy yet lumpy potatoes with BACON (Bacon bacon bacon) and a secret that makes them sweet as well. THIS MAY BE THE PERFECT MASHED GARLIC POTATOES RECIPE! A Crowd Pleaser! This is the recipe I take to any pass a plate, Church PotLuck type event. The mashed potatoes I make for myself and my family on any Tuesday night are different than the mashed potatoes I make for company. I load them up with Butter, Sour Cream... I even smooth them out with extra creamy Half and Half. Outside the Box DRESSING... This savory flavorful colorful dish would fit in with any gathering, a Friendly PotLuck, Family event, Of course a Holiday meal and even though there is beer in the bread, the alcohol cooks out so of course this would be welcome at any Church PotLuck as well. Or how about just on a Tuesday night. This is easy, very little prep work, plenty of vegetables to make this an all around side dish...just add a pork chop (or sliced Rotisserie Chicken)! Sweet and Spicey! FANTASTIC Side Dish or a complete Main Course Asian inspired Fried Rice dish that satisfies in every way! Deliciously sweet fruit pairs with the spices to make this stand out on any table! Shhh... Don't tell anyone, but here's the recipe for a better version of Chipotle restaurant's Cilantro Lime Rice. Most of the secret recipe is in the name, but I make my rice with Chicken Stock in place of water, Adds a much richer flavor. 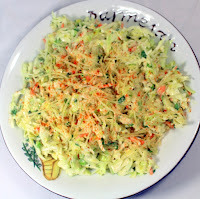 It's a simple to make side dish (just an occasional stir), always welcome at any big family event, dinner or potluck. The rice will stay warm and fluffy in a crock pot for hours, just stir and fluff right before serving. Oh BOY Scratch made CORNBREAD! But not just any cornbread, this is loaded with corn, onions, and even a little jalapeno peppers. There is even more than a cup of REAL Corn in the Cornbread! Cheesy and amazingly moist (that's the buttermilk) and you have something special. Not the dry bland box mix. Takes only a few minutes more but SO MUCH WORTH THE EXTRA DIY EFFORT! Don't let the Broccoli in the title scare you, this is the BEST Cornbread recipe you will ever eat. A regional North Carolina Classic. Probably no Southern PotLuck in the last 50 years has been without at least one pan of this. The secret as every Southern Belle Or want to be Southern Belle knows is the Cottage Cheese in the recipe. Makes the usually dry Corn Bread sweet and creamy instead. 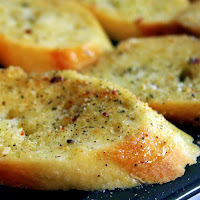 Garlic Toast... Cheap and Easy for a CROWD! Sure sounds simple (AND IT IS), but this DIY is designed for when you need to make a LOT for a hungry crowd. Cost effective, EASY and QUICK. Turn a dollar and a quarter French Baguette into 20-25 slices of garlic-y Herbal Italian goodness! These are WOW rolls. A little hint of Coconut and Pineapple flavors. Made soft and creamy with milk and potato flakes. This is the recipe for store bought Hawaiian style sweet rolls just INTENSIFIED!!! All made EASY with a Bread Machine doing all of the hard work! AT LAST, bread machine easy loaves of moist, tender, perfect crumb, deliciously seasoned loaf of WHEAT BREAD. Easy to DIY and plenty of bragging rights when you serve a fresh hot loaf of bread... And did I say EASY! This one has it all... Meat (pound of sausage), vegetables (onions and peppers), Potatoes (Kids love anything with Tater Tots), Eggs (dozen servings, a dozen eggs) and plenty of cheese to get that delicious crust of cheese on the top. A crowd pleaser for any crowd! It's a classic Quiche Lorraine made in a 9X13 Casserole Pan, 20 Servings makes this perfect for Leftovers (midnight snacking at it's best) or for the Holiday Crowds of visitors or any PotLuck Brunch. LOADED with Bacon and Cheese and DELICIOUS! EASY FAST and even EASIER when you do most of the work ahead of time! I love making Quiche. About as easy as it gets, including making a scratch butter crust (really that's easy too). This is a classic easy to make Quiche Lorraine, which is simply a savory BACON BACON BACON CHEESECAKE! Don't say the quiche word and the men in your life will love this. AND it's Freezable, make two... And did I mention EASY! Anything eggs works for breakfast, but this made for a wonderful vegetarian dish. Can easily be served as a side dish or with all the protein rich eggs, certainly works as a vegetarian main dish. The dish is a slightly goosed up version of a quiche. Instead of a pastry crust, a bed of Spaghetti Squash becomes the tangled webbing to absorb the eggs and create this mix. The eggs are flavored with lots of Garlic!! !, Goat cheese!!! There are a couple of extras in this recipe that will make your mini treats stand out. Not the least is the extra pop of lemon juice that makes the blueberries POP with extra juiciness... The BEST! Tiny enough you can just grab and pop in your mouth on the go or relax with a cup of coffee and visit. Add a little fruit garnish and you have a treat platter worthy of any PotLuck occasion or pass a plate event. The Sour Cream adds EXTRA Moistness on top of the EXTRA Nutty Walnuts makes this EXTRA special. Mini BLT Muffins Bacon Lettuce (Basil) and Tomatoes. OH BOY Mini Muffins! And these are extra special. All the savory flavors of a BLT Sandwich Bacon - Basil (For the Lettuce) and Tomatoes in a bite size savory breakfast snack. 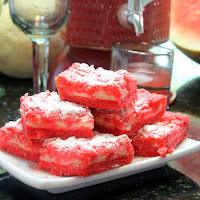 Perfect for any PotLuck pass a plate event... BACON!!! APPLE PIE MINI-MUFFINS The Magical Allure of the Mini-Muffin!!! Perfect size for snacking, wonderful size as an add on to a breakfast... Easy and Fast to make a BUNCH, making them perfect to offer as a Catering or any "Pass a Plate" PotLuck option. And best of all... THESE ARE AMAZING! Loaded with Apples for a natural sweetness, spices to remind you of an apple pie. LOVE THESE! INCREDIBLY Moist fluffy and creamy. 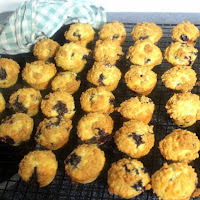 A wonderful tip for extracting the most juicy flavor from the blueberries and just a great recipe for beautiful golden brown delicious fluffy tender muffins! Try them "Mini" Muffin size and watch them disappear! A real Crowd Pleaser! WOW oh WOW, a new FAVORITE Breakfast "Sandwich"! A little Sweet, A LOT Savory and BACON BACON BACON! Make extras cause these disappear fast. These would indeed stand out at any Church Social (Breakfast or Lunch), as well as an excellent Catering Idea (I always want something special that stands out as a memorable option - and these are MEMORABLY DELICIOUS)! This is a STAND OUT dish of sweet pastries. Amazingly moist, tender and fluffy, not too dense but simply amazingly delicious. The sour cream makes em extra moist while there is a secret little extra ingredient that adds a hidden layer of nutty flavor. 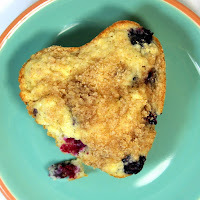 PERFECT for a pass a plate breakfast or a stand out for a PotLuck! My second secret ingredient adds a slight nutty extra making these about as delicious as possible. I also like to use mini chocolate chips that give that LOADED TO THE MAX look with Blueberries in every bite! 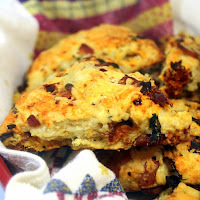 And these are wonderful savory scones, a little bit sweet... A little bit nutty (there is a secret ingredient)... And a lot tender and moist (Yet a second secret ingredient that makes these extra moist). Add in the Earthy cheesy goodness of the Cheddar and the Savory Spicy Garlic and Bingo Bango Bongo you have a Tasty treat for breakfast, a side for dinner or a treat for an afternoon Tea! This may not be my Million Dollar recipe, but it is my Thousands of Dollars Recipe. From my very first catering order until the big order I filled this morning, this has been my most requested lunch item. It may take awhile, but eventually I am sure it will live up to the title of - MILLION DOLLAR CHICKEN SALAD WRAP! LOADED with lots of little extras... Crunchy Celery, Sweet Apples, Juicy Grapes and even Savory yet Sweet Onions. If you add everything together, there are about as many extras as there is chicken. Just layers upon layers of flavors! BLT with Cajun Garlic Aioli Delicious in their simplicity and always a popular Sandwich. But there are a few tricks to make your Bacon Lettuce and Tomato sandwich better... Worthy of a caterer! Worthy to serve at any "Pass a Plate" Event, PotLuck or family gathering. You will LOVE This Sandwich! Fancy Bacon and Fancy Mayonnaise... Here's the recipes! In every cooks' life you are going to be asked to supply a tray of sandwiches. Events, parties, showers or even an afternoon tea. Here's a simple Sammy with unusual ingredients that are DELICIOUS and affordable to make for a crowd. Occasionally you get a special request for something light and vegetarian. This is it! The secret is the Sun Dried Tomato Pesto (recipe included). Naturally sweet tomatoes load this simple little sandwich with so much flavor. A trip to the deli for lunch meat and sliced cheese, combined with a ball of pizza dough (recipe in the post) and you have everything you need for this crowd pleasing sammy... EASY and Spectacular looking, all the tastes of the classic recipe gives you a new twist in a pizza! That inexpensive (CHEAP) tube of bulk sausage can be upgraded... This post has a wonderful recipe for a SIMPLE FAST Sloppy Joe using a Tube of Sausage... All slathered on a Baked Potato! It is the Thrilling days of yesteryear as all the secrets to Mom's (or maybe Grandma's) moist and delicious, Onion-y and maybe even cheesy Meatloaf are laid bare. Many have tried but there is simply nothing as crowd pleasing as the tastes that remind us of Mom's Kitchen! No joke... These are amazing and simple to do. They are marinated overnight and then BROILED in the Oven. that's it. Cooks fast, in only about 10 minutes. But that marinade stays with 'em. Salty from the soy sauce, hints of Asia from Sesame seeds and oil, Ginger and Kiwi, sweetened from Brown Sugar and Honey... And all seeped into the meat with carbonation from a couple of bottles of 7-Up (really, helps the marinade to get deep into the meat). The end product is simply amazing. Deep rich beef flavors with all the hints and flavors of Asia! 100% Scratch BRAGGING RIGHTS Recipe PERFECT for sharing God's Bounty and your cooking skills (BUT plenty of suggestions for easier alternatives) Hints and tips that will make this such a memorable dish. Even tips on transporting so it is served at the perfect temperature... SUCH A GREAT RECIPE! LOTS of step by step instructions to make fresh pasta, meat sauce, Bechamel Sauce and hints to make it all come together! Macaroni and Cheese is on every buffet table. Often many versions. This one WILL STAND OUT! Chicken filling, plenty of creamy cheese and the spices that make this stick to your ribs! Made easy with Rotisserie chicken and delicious with the Spices! Make extra to freeze for a second meal in a month! I LOVE this casserole! Cheesey as any good macaroni and cheese should be, but with that extra kick from Green Chile seasoned tomatoes, a little extra spices and all made EASY with pre-cooked, pre-seasoned Rotisserie Chicken. THIS IS NOT A BORING OLD PASTA and CHICKEN RECIPE! And FAST... 30 minute meal. With Freezing instructions (I like to make two, one for today and one for a month from now). The recipe uses lots of time saving ingredients (like using a spicy cheese dip). With a KILLER Tex-Mex Brown Sauce that will make this a monthly MUST MAKE AGAIN DISH!!! EASILY FREEZABLE. A base of baked potato slices covered in just about anything you can think of from a baked potato bar... Chili, cheese sauce, even loads of vegetables - Corn, Tomatoes and broccoli. Plus of course BACON BACON BACON all topped with cheese and green onions. Freezing instructions included. Make 2 one for now and one for when you are too busy to cook! AS GOOD AS IT SOUNDS! Meat and Potatoes! Sometime you just want MEAT and TATERS! Plus a few extras (tomatoes and the AMAZING taste of Fennel), all with a little hint of Swiss Cheese. And it doesn't take too much effort to make two of these at the same time, freeze one and pre-cook dinner for a day when you are busier than usual. Easy to prepare... AND DELICIOUS! By definition, it's Chili mixed with Macaroni (that's the "Mac"). And sure enough, that;s what this is. I left out much of the liquid so the dish is more of a Cut-able Casserole. AND WOW is this GOOD! 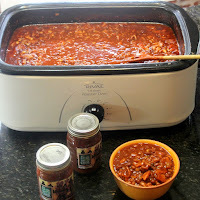 All the tastes flavors and spices of a Chili, Combined with a pasta and you have a traditional School Lunch dish... Just Jazzed so that it shines on any "Pass a Plate" PotLuck occasion. KIDS LOVE THIS DISH! 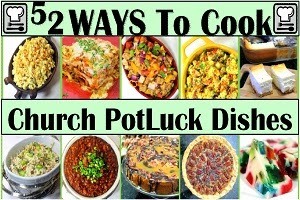 Low Cal - Stretch Your $$ - 52 Church PotLuck Casseroles - WHAT A GREAT CASSEROLE! Pasta to stretch your servings (Cheaply), LOADED with veggies (Fresh) onions and Sweet peppers, and (Frozen) Peas and Corn! FIlled with seasoned tomatoes and plenty of cheap and easy cooked Rotisserie Chicken --- HEALTHY! LOW CAL! EASY TO MAKE! and most of all... DELICIOUS! Oh Boy, this is terrific. My less than enthusiastic embrace of hot fish dishes is on record, but this is good... REALLY REALLY GOOD. A single tsp of Chipotle in Adobe Sauce added to the mix adds an extra layer of flavors, plus a couple of hints to make this a favorite around our house. Extra peas, extra cheesy and extra tips to make this a successful dish for the non-hot fish dish eaters in your family! If you like a Reuben Sandwich, you will LOVE this idea! Shhhh... It's a SAVORY BREAD PUDDING. Think a Reuben with an egg on top. All made convenient and beautiful crusty golden brown in Casserole form! Beautiful, tasty, unique and memorable. Fits on any buffet table I can imagine! I have to be honest, I do not care for Hot Fish Casserole... But my Wife LOVES IT! This is about her favorite meal. SO, Happy Wife, Happy Life, and a fantastic Casserole. Plenty of cheesy goodness, plenty of Tuna flavor and best of all... Garnished with (my Favorite) Fish Crackers! Those make me happy too! One Dish EASY to make!!! This is a very easy to make classic... been around as long as I can remember and is always LOVED! A Pound of hamburger, some seasonal vegetables (or frozen and canned), a package of TACO Seasoning and a couple of boxes of Jiffy Corn Muffin Mix and you have a CROWD Pleasing recipe. perfect for the Church Potluck, a neighborhood BYODish party or a quick easy weeknight meal. The classic casseroles are always the best! Sometime you want to give the kids what they want... TATER TOTS! And with this you have all the classic ingredients of a Chicken Parmesan... Chicken, Tomato Sauce, Cheese, Breading (the Tots), and then I tossed in Vegetables, Corn Onions and Peppers... Popular and DELICIOUS! A thick rich stout gravy holds the filling of Turkey, 5 different vegetables and seasonings and transfers leftovers (or heck, this is so good, make the meat special for this) into something special. Two potatoes (whipped Russet and whipped Sweet Potatoes) make a delicious mix of flavors for the topping. ALWAYS a crowd pleaser! - 52 Church PotLuck Main Course... One of my very favorite meals of all time (and among the easiest to make), Hamburger Stroganoff is transformed into a casserole. Similar to a British Cottage Pie with a cap of mashed potatoes. The recipe is FREEZABLE, make one now and make an extra to enjoy in a month. TIPS and TRICKS for freezing are included! You may think you will never use this, but the recipe comes in VERY handy when needed. The leftovers freeze easily. But for the day before the big family event, Church special occasion, Pre-Thanksgiving or Christmas handy sandwich (stays warm in a Crock Pot for HOURS). And best of all, this is REALLY GOOD. Not just ketchup and hamburger. Recently my favorite store had 5 pounds of hamburger on sale. I AM CHEAP This BIG batch priced out at about $20, MORE than 50 Servings! 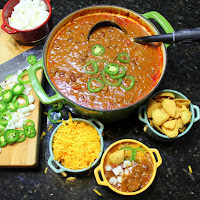 BUT Also, This is a FANTASTIC Chili recipe, filled with flavors and perfect for a COLD winter day. This is a handy recipe for feeding an army or freezing for when needed. You WILL LOVE having this recipe around. This is about the EASIEST thing you can make. The payoff is 4-5 pounds of pork, perfect for any big gathering, party, neighborhood PotLuck or to take to church. Sweet and spicy and delicious and did I mention easy??? This is an "OMG, really that easy???" recipe. Only three ingredients, a few hours in the crock pot and an amazing spicy moist flavorful BIG batch of meat. Feed an army with only a few minutes hands on work. Very economical and about as good as it gets! Holiday Church PotLuck Main Dish and even a great item for catering. SO SO SO EASY... The mustard combines with a sweet Brown sugar glaze, with hints of the south - Bourbon and Pistachios add an amazing crust and crunch to the ham that will become a seasonal MUST MAKE TREAT! 7-Up or Sprite steams lemon lime flavor into the bird from the inside out as the turkey is roasted to golden brown, MOIST ad tender and DELICIOUS EVERY TIME... Never a dried out bird. Add some BBQ sauce and you have a Great Holiday Turkey! LOTS of DIY Photo step by steps and hints and tips for success! 52 Holiday Dishes... And really, this recipe never fails. ALWAYS a crispy skin. ALWAYS a Golden brown and delicious color... ALWAYS Moist tender and delicious... AND ALWAYS A CROWD PLEASER. Just follow the simple directions to start and forget it until serving time. No basting, no checking, no worries... A WINNER FOR EVERYONE! These little gems have MORE THAN ENOUGH FLAVOR to satisfy any Tex Mex cowboy (or cowboy want to be). Spicy tomato juice is added to hamburger and Chorizo sausage. BBQ Sauce brushed, even Fritos Corn chips are in there. But also more than 2 cups of vegetables are mixed in and well hidden. And of course everything is better with BACON BACON BACON! The ULTIMATE New Orleans Dish gets an easy freezable casserole look. LOADED with Chicken, Sausage and Cup after Cup of vegetables! Easy, Fun to serve and always DELICIOUS! Recipe from New Orleans School of Cooking. This is an OMG AMAZING PRESENTATION that will delight family friends and stun your enemies. And beat of all, this is INCREDIBLY EASY. There is a small trick to getting the bag to stay Gravity Defying, but that is really really easy as well. All the hints tricks and amazingly simple details in the post so you too can DIY AMAZE YOUR FRIENDS DEFYING GRAVITY! Like the title says, THREE Types of chocolate, Chocolate chips are loaded into a moist Fudgy cake brownie and then the whole thing gets covered in a fudge chocolate glaze. This indulgent dessert is sure to be praise worthy for any gathering of family and friends... A GOTO got to take something DISH! The brown sugar is melted into butter, making the whole thing so buttery soft and chewy. The toffee bits are small and soften as well during the baking so the whole brownie is about as good, soft and EXTRA chewy as you can get. THESE BROWNIES ARE THE BEST!!! Always popular, these little square gems are just about every bodies favorites. The Toffee crust is light, soft and chewy. The soft Chocolate Ganache topping is incredibly easy to make and allows the crushed almonds to be gently pushed into the chocolate so nothing flakes off. Only a few ingredients that are probably in your pantry right now, these cookie bars are sure to please! I am constantly on the look out for an Adult Cookie. With a real PUNCH of flavor. You will need to break out your microplane zester for this as the recipe features the ZEST of SEVEN lemons. That's where the real lemon flavor is. No need for frosting, sprinkles or funny shapes... Just big girl grown up flavors that pack that PUNCH! Old School... And deserves to be in every cooks repeat recipe file. Crispy, crunchy, sweet, chocolate, hints of Peanut Butter and Butterscotch. A great DIY project to make with the kids (maybe share a story of your youth). This is what I like to call a Show Off Cake... Those EDIBLE CANDIED LEMON slices make a stunning presentation, but the Taste is LOADED with flavors. From the Lemon Cookie Crust to the fresh made Lemon Curd in the filling and layered on top, this is AMAZING. Perfect to Show Off at any Church PotLuck or family gathering... AND IT IS EASIER THAN YOU THINK! HOT Dog days of summer... What a great time for this EASY and spectacular cold pie. All the work is done hours ahead of time so you just pull from the ice box and serve. 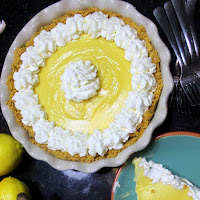 Extra creamy texture, Extra Lemony taste, Even extra lemony flavor in the scratch pie shell and you have the winner you needed on those dog days of summer! This looks like an expensive store bought cheesecake, rich and luxurious looking with artful random swirls of chocolate and caramel on top of roasted pecans (the Turtle part). The cheesecake part is a rich thick custard with pumpkin color and taste. EASY and seasonally the PERFECT Fall Dessert! OH MY... So much in this. A little bit Blondie Brownie...A little bit Cheesecake...A little bit Banana Bread...AND all on top of a SOFT moist fudgy chocolate Faux OREO Pie/Cake Crust!!! It's a great way to use up "Bad" overripe bananas. But love the combination! A stand out WINNER! But not just any Cheesecake, this one is PACKED with peaches. I made the recipe year round using canned peaches,but I actually used fresh seasonal local Missouri Peaches for this recipe. And the result is a creamy sweet custard that has peaches in every bite! Made nice and tall in a Springform pan but could easily be made as bars in a Casserole pan.Makes for a welcome dish at any "Pass a Plate" occasion. A stand out dish to serve. 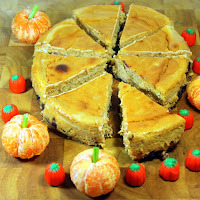 World's Best PUMPKIN CHEESECAKE!A WONDERFUL dessert seasonal for fall but delicious year round. Simple to DIY and the real gem is the crust made from Pecans, Gingersnaps and a few Chocolate Chips. Indeed this is THE WORLD's BEST PUMPKIN CHEESECAKE! Sweet and Creamy cheesecake with a Graham Cracker Crust. Flavored with that PUNCH of flavor from Florida Key Limes (Be sure to add the zest!). This is about the easiest scratch cheese cake recipe. Never cracks and always pleases! Almost healthy... A full pound of fruit, plenty of colon cleansing oats. The texture is soft and chewy, with the cream cheese fruit filling practically melting the usually hard oat/sugar mix. Could be the perfect bar. But honestly it's the taste. Rich seasonal raspberries, sweetened with sugary cream cheese, all wrapped with an almost brownie like base and crunchy oat topping. RICH Double Chocolate Brownies, topped with the illusion of Raw Cookie Dough. All of the taste and texture of raw but NO Raw EGGS. Safe to eat and delicious. Great presentation and double double chocolate with the addition of the little chocolate chips in the "Icing"! A MEMORABLE Favorite Take along treat for any big gathering, church social or family get together! OH BOY FUDGE!!! Ummmm... Wait it still has a brownie look and taste. Sweet and creamy like a fudge, a hint of cake-y texture like a brownie and even a bit of crunch (Loaded with chocolate chips inside). That marbled look on top comes from a layer of cream cheese brownie mix for even more flavor! 52 Cookie Recipes for Church PotLuck and Catering... And for a wonderfully nutty gooey chocolatey delightful snack dessert dish! OOEY GOOEY and CHOCOLATE!!! These are VERY FAST and VERY EASY to make. Occasionally a box cake mix and a brick of cream cheese go on sale. With a little planning, and a well stocked sale priced pantry, I pretty much always have the ingredients to make these. So ,. Need a dessert to take to someone's house... these work great Decide at 5 PM you want a dessert after dinner... These not only work, they are perfect. But of course best of all... taste GREAT! This is the cookie bar that you need to take to a pot luck... AMAZING tastes, PLUS amazingly easy. 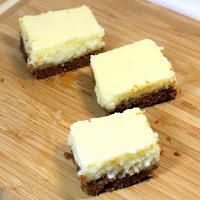 Store bought cake mix and a few pantry ingredients plus a small can of pineapple and you have a chewy soft bar, cream cheese frosting in the center and simply DELICIOUS! Plus a rustic interesting very pretty look to be proud of. And did I mention about as easy as it gets to make these. Any flavor works, but this is PINEAPPLE JAM! A WONDERFUL Cake that is a bit hard to name. Half is a cheesecake, so that had to be in the name but it is also an Almond flavored coffee cake. IT IS SOOOO EASY. Just pick a favorite Jam or Jelly and away you go...This was Pineapple Jam but Peach, Cherry, Apple... You name it works just fine! I do LOVE this recipe, a Ribbon of sweet Cherry flavored Cream Cheese and a moist chocolate chip LOADED Coffee Cake is simply DELICIOUS! Simple to make, easy to adapt to any flavors you might like. Stunningly BEAUTIFUL! SALTED CARAMEL Apple Pie - BEST APPLE PIE EVER! 52 Church PotLuck Dishes Catering Cakes and Pies... Really is an amazing combination of Salted Caramel and Sweet Apple Pie Filling. All the childhood fun of a caramel apple in a PIE FORM! WHAT A GREAT FALL SEASONAL PIE. A Layer of Apple Pie topped with a layer of Cream cheese smooth spiced Pumpkin Pie. All our favorite Fall Pies in one! A new take on an Old 50's and 60's Classic. Your Grandmother probably served a version of this up at her Church Potluck and the Oohs and Aahs still follow. Truth is it is about as easy a DIY project as it gets. Store bought cake mix and a few pokes with a chopstick. You will be the STAR OF THE SHOW! This SPECTACULAR Cake is sooo easy and the payoff in presentation and taste makes this a winner in every way. 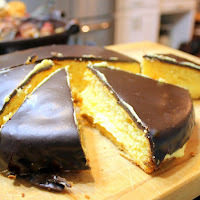 two layers of moist cake with a center layer of thick creamy vanilla pudding- All topped off with a layer of sweetened poured chocolate Ganache (VERY EASY and TIPS are included). This looks bakery difficult but is really very very easy to DIY! SOOOOO Easy to make. Using store bought mixes and even a store bought can of frosting. Perfect for Easter or any family or group event that calls for Deviled Eggs (and isn't that All of them?). A Whimsy that the Kids and Old Folks LOVED! There is a little bit of history to the recipe as many lay claim to being the origin. Truth is (maybe) this Southern style cake has evolved from lowly origins to becoming one of the most famous cakes ever. Buttermilk and vinegar are combined to make a velvety smooth hint of chocolate Devil's Food cake with a stunning beautiful presentation. Famous and Deservedly so. Now we are gettin FANCY!!! DELICIOUS and FAST. Perfect when you need something homemade FAST (and EASY)! It's a simple rustic presentation, dressed up with the drizzle and the delicious orange infused sugar. BUT the taste is Spectacular. A rich butter sponge cake Orange flavoring throughout and those wonderful toppings! Start to finish 1 hour, includes baking and cooling time. This recipe is a WINNER and KEEPER in taste! I LOVE Custard pies in general and Banana Cream in specific. This recipe combines everything I especially love... Creamy thick pudding consistency, LOTS of bananas ( this pie holds FIVE), A dramatic look (big DOMED). Add the Pretzel crunchy salty Crust to the sweet Whipped Cream topping and it just may be the BEST PIE EVER!!! This has so much... 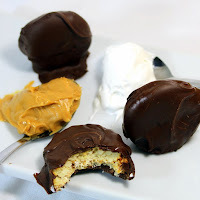 I LOVE the salty mix of flavors... Chocolate and Peanut Butter, Sweet Savory and Salty. There are lots of steps, but it really is practically fool proof and SO MUCH worth the effort. Once this cake becomes a habit, no one asks for a sliver, ALL BIG SLICES! Custard Pies really are the best! This custard is flavored with lightly toasted coconut for that extra sweet exotic tropical flavor. The easy to follow DIY Instructions will make the cook the HIT of any PotLuck Family Dinner occasion. Be sure to add that MILE HIGH Domed Whipped Cream Topping for that extra PIZZAZZ! This Ohh and Aaahs inspiring cake is amazingly easy. Uses a box of pudding to help the custard filling come together. Adding a unique Salty/Sweet Pretzel crunchy crust adds a new unexpected texture and taste to the pie. I made three pies for Christmas this was BY FAR the most popular! AND EASIEST! It's a NEW Favorite family recipe that left everyone wishing I made a second pie. "Old School" Scratch recipe that is dramatic (High Top Domed Meringue) but is actually easy to do. Make ahead dessert that has GREAT taste and lots to brag about! Whoop de Doo... This is my special GOTO recipe for any Holiday, Special Occasion, Big Family Gathering or just when I want to cook to impress... Deliciously nutty, chocolaty, sweet with an Earthy custard center... And tastes just as good as it looks and sounds! As to the pie.... WOW... This is fantastic! Nutty pecans throughout, a sweet caramel custard isde and roasted crunchy pecans on top... Oh So Pretty. I happen to LOVE a pecan pie. This is now my very favorite. That caramel sauce mixed into the sugary egg custard sends this over the top. A perfect pie to take to any family gathering, to contribute to a PotLuck or to serve up at a Holiday Meal... THIS IS THE BOMB! This is my VERY FAVORITE APPLE PIE. Loaded inside and on top with 3/4 cup of Sharp Cheddar Cheese. That extra sharp snap of the cheese combines with the sweet seasoned cook apples to make a Wisconsin treat. I even added my Mother in Law's Old School never fail Flakey lard Crust Recipe!!! THE BEST! It's HIP TO BE SQUARE (Well, rectangular). Make your pies in a 9X13 Casserole dish. Makes twice as much (do you ever have too much pie? ), MUCH easier than making two pies. As to this recipe... a spiced fall Apple Cider flavors and moistens this to an AMAZING degree. BEST APPLE PIE EVER and so Easy to DIY! Secret ingredients... little extras that add an additional layer of flavor to a dish. Something difficult to pick out yet adds a distinctive taste that sets similar dishes apart. And that is what is happening here. This is a basic apple crisp recipe. Add some oatmeal and you have a pretty good Apple Crisp... Add a secret ingredient and the dish snaps with flavor! It looks and Tastes like a Pumpkin Pie but it is Sooo much easier to make from scratch and Sooo much better tasting. 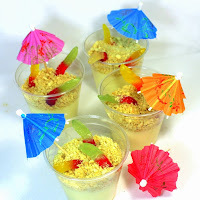 Fun to Make, Fun to Say and a Fun Crowd Pleaser recipe! BETTER THAN PUMPKIN in EVERY WAY! Oh BOY YUM... Just as good as it looks, a thick Strawberry glaze over fresh strawberries and a cool creamy Cream filled pie... All this sweetness over a salty crunchy crispy Pretzel crust. Sounds complicated but very EASY to DIY! I love BREAD PUDDING. The dish started out as a way to "use up" bread that was no longer eatable. But with a little effort you can combine stale bread, and a sweet eggy custard to make a thick combination of cake and custard. This traditional southern sweet bread pudding gets an APPLE PIE update, a drizzle of caramel sauce becomes an adult version of the kids Halloween treat, the CARAMEL APPLE. I LOVE Bread Pudding and this is my very favorite sweet dessert pudding. Loaded with wonderful tropical tastes and flavors. Pineapple and Coconut (primary ingredients in a Pina Colada) are mixed with pecans and white chocolate chips (just to make it more festive). And then everything is mixed with a typical bread pudding (egg custard combines into a cake texture). Recipe for a RUM Sauce included (optional Virgin Sauce as well! They may not be the prettiest plate of dessert food ever, but they disappear quick. They are incredibly EASY (only 3 ingredients), FAST to put together (feeds 25 people), but most important... DELICIOUS! Here's the old school TONS of flavor, so much more than the instant box versions! Served this up for Children's church AND as a Dessert for a grown up dinner party. EVERYONE Raved! 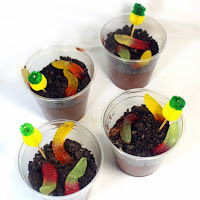 Gummy Worms wiggling through a bed of "Dirt" (Smashed cookies and cream) and burrowing deep into pools of Chocolate Fudge Pudding! Easy to make snack perfect for Children;s Church. Kids LOVE these! A new riff on the classic Worm in Sand... Gummy worms are crawling out of the sand (Cookie crumbles). Dig further and find pools of Banana Cream Pudding. For ANY TAILGATING treat. EASY to change colors for any sports team, pro, college or T-Ball but of course, GO ROYALS! The simplicity of this "recipe" does not at all diminish the popularity. 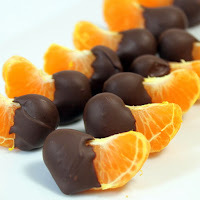 EASY to make, CHEAP to make and a real crowd pleaser fo adults and kids alike. 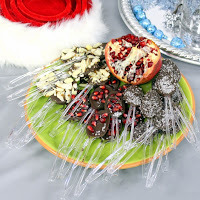 Served these up to our Children;s Church Snack and the kids gobbled em down! This is amazing. More than enough chocolate layers of flavor for any chocoholic. Unsweetened chocolate cake like base, with Semi Sweet Chocolate Chunks and dipped in sweet creamy milk Chocolate. WHAT's NOT TO LOVE??? Baseball fever is hitting my area and my heart (Live in KC but grew up in Cubs Country). These beauties let me root root root for my home team (or my heart team). EASY to DIY this sugar cookie recipe makes terrific soft cookies perfect for any party (or for the children;s church snack we provided this week. ENJOY and cheer on my beloved Cubs! EASIEST NO BAKE CHRISTMAS COOKIE EVER - Nutter Butter Santa Cookies! This is so easy to DIY. Only a handful of ingredients and you have a kid friendly snack for our Children's Church or a "Kid Will LOVE" Cookie for the holiday season! This is the "fancy" looking cookie that ANYONE can make! All the easy to follow directions are here. I made these for our Church Sunday School Snack... 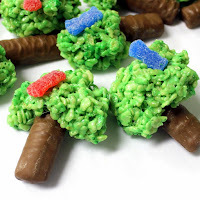 Simple to make, just a few mini candy bars, a little "glue" and M and M's plus the driver... Cute, FUN and delicious! Easy and beyond easy... These are wonderful party items. You can top them easily enough with almost anything you have left over from holiday baking. I like the Pomegranate seeds, mostly for the holiday colors, nuts, holiday sugar cookie decorations... But feel free to let your imagination run wild... Try some BACON BITS! Really! Or butterscotch bits, ground up candy bars (Butterfinger or toffee bars)... But Really... TRY BACON! Shhhhh! - 52 Cookie Recipes... Some days you want to show off. Here are some easy to follow tips to make your plate of chips BETTER than the rest. Extra Texture, Extra Flavors (One a shocker) and Extra Chocolate secret ingredients that demand respect (and love). Just keep the secrets under your hat or everyone will know! Hawaiian Cookie Bar - Blondies!!! Wow this is amazing. Thank you so much for sharing. I todo remember the days of bringing the "utensils". Because I was not a very confident cook then but now I share whatever I cook and I love it. Thank you again.